Posterior tibial tendonitis causes pain along the inner side of the lower leg, ankle, or foot. Tendons are strong bands of connective tissue which attach muscles to bones. The posterior tibial tendon helps point the foot down and in. Tendonitis is inflammation of a tendon. Posterior Tibial Tendonitis occurs from overuse of the tendon. 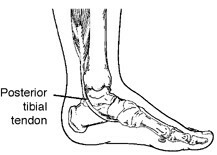 This tendon attaches to a bone in the foot called the navicular and helps stabilize the arch. If your arch flattens out more than normal when you walk or run, it is called over pronation. When you over pronate you strain your tendon and are at risk for Posterior Tibial Tendonitis. Your Foot and Ankle Specialist will review your symptoms and examine your leg, ankle and foot. Your foot will typically be tender along the course of the tendon and where it attaches to the navicular bone. Ice- Applying ice to your foot for 20-30 minutes every 3-4 hours for 2-3 days or until the pain goes away. Ice massage can also be helpful. Elevation- Elevating you lower leg and foot by placing a pillow underneath it. Try to keep the foot above the level of the heart. Orthotics- Your Foot and Ankle Specialist may recommend special arch supports or inserts for your shoes to support the tendon and prevent recurrence of the injury. Taping- Your podiatrist may perform special taping and/or show you how to perform this taping to support the arch, the tendon, and the insertion of the tendon onto the navicular. Casting- For acute injuries, your doctor may apply a cast for a few weeks until the pain and inflammation go away. Medications- Taking anti-inflammatory medication may be prescribed by your provider. NOTE: Please consult your physician before taking any new medications! Physical Therapy- Doing exercises will improve your tendon strength and flexibility. Physical Therapy will help you return to your normal activities or sports and help strengthen the area to prevent re-injury. The goal of rehabilitation is to return you to your sport or activity as soon as is safely possible. If you return too soon you may worsen your injury, which could lead to long term damage such as Posterior Tibial Tendon Dysfunction. It is important to see a Foot and Ankle Specialist if you are experiencing foot and/or ankle pain to get a proper diagnosis and treatment plan.